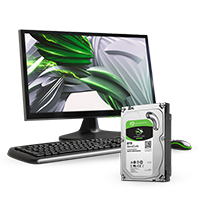 Seagate have over 20 years experience of bringing speed and reliability to our home or work storage options and continue to produce outstanding quality hard drives throughout their entire range. The Seagate BarraCuda drive represents the pinnacle of versatility. The 3.5" form factor version slotting straight into any supporting desktop – Seagate BarraCuda is the perfect solution for any storage issue you may have. Depending on the size of the job, Seagate has a drive for you, the 3.5 inch is available in multiple capacities including 1TB, 2TB, 3TB, 4TB, 6TB and 8TB. Seagate BarraCuda hard drives are equipped with MTS or Multi-Tier Caching Technology which takes your PC to a whole new level and allows you to load your applications and files faster than ever before. By applying layers of DRAM, NAND Flash and media cache technologies, Seagate BarraCuda delivers improved read and write performance by optimising data flow. Fantastic speeds are consistently delivered by Seagate and the new BarraCuda brings through an amazing transfer rate of 6 GB/s over the SATA interface and up to 220 MB/s sustained rate depending on the drive size. Combined with spin speeds of 7200 RPM, the BarraCuda will power through any tasks and provide a solid base to install anything from games to work documents. The Seagate BarraCuda series of reliable hard drives are here to stay for years to come. 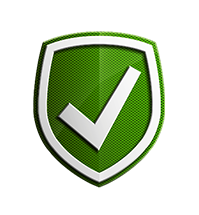 Backed by a 2 year warranty and with more than 20 years experience, Seagate manufactures and delivers super-reliable hard drives. Seagate BarraCuda is often recognised by leading publications and consumers. 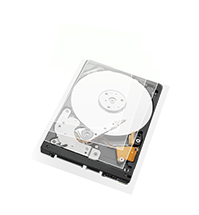 Do you have you a question about the Seagate BarraCuda (1TB) 3.5 Inch SATA Internal Hard Disk Drive? Q: are these products new? Yes, this is brand new. Good value, great product & fast well packaged delivery. Top seller A class product. Quality hard drive for a decent price. Seagate's work from the beginning has been exemplary even with disk software for testing. A dependable, trusted brand with vfm. I bought the drive to store all my game libraries on. It was easy to install but what 3.5 inch drive isnt. Fast enough for what Im using it for and great value for money would buy again or even one of the bigger drives from the range. Haven't had a single problem to-date. An excellent product at a reasonable price, promptly delivered. I have bought three of these drives over the last decade so I must be happy with them. I tend to replace them after 4 years (16 hours a day 7 days a week in use). Decent price, good reliability and quick enough for personal use. Happy to recommend.